Last Friday was our once-a-month snack time at work. Four or five people bring something each time for our large group. Knowing there was going to be a lot of good food at work that morning, I brought my camera so I could take some pictures. Tammy brought several yummy things, and this was one of them. Everyone loved her Bacon-Cheese Pull Aparts! She found this recipe at Food.com and said it was really easy to make. I asked her if I could post pictures of her delicious creation, because I’m sure a lot of you will want to make this…I know I do. It’s a tasty mix of melted cheddar cheese and biscuits, with crumbled bacon and chopped green onions added in, too…who can resist that? Preheat oven to 350 degrees. Spray an 11×7″ or 12×8″ (2-quart) glass baking dish with cooking spray (if you don’t having either of those size pans, you could probably use a 9×13″ pan–it just may turn out a little flatter). In large bowl, beat egg and milk with wire whisk until smooth. Separate biscuit dough into 8 biscuits and cut each biscuit into quarters. Gently stir the biscuit pieces into egg mixture to coat evenly, then fold in bacon, cheese, onions, and mushrooms, if desired. Spoon the mixture into your sprayed baking pan and arrange biscuit pieces in a single layer. Bake 23-28 minutes or until golden brown. Serve warm by cutting into squares, or just pulling biscuits apart. Makes about 8 servings. 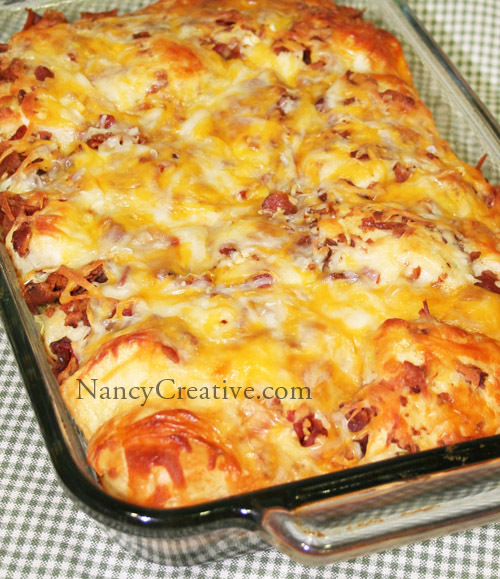 Here’s a close-up of all that cheesy-bacon-onion yumminess! 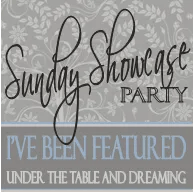 Linked to Sunday Showcase, Potluck Sunday, Tempt My Tummy Tuesday, Tuesdays at the Table, Tasty Tuesday, We Did It Wednesday, Show and Tell, Make It Yours Day, Strut Your Stuff, Show Off Your Stuff, Foodie Friday, Sharing Sundays. This entry was posted in Appetizers/Snacks, Breakfast/Brunch, Food and Recipes, Guest Chef and tagged bacon, baking, Biscuit, breakfast, brunch, cheddar cheese, Onion, recipe on November 7, 2010 by nancyc. Do you consider this an appetizer. It looks so delicous that I might bring it to a party next week. You know, it probably could be…I’d cut it up into smaller squares to serve as an appetizer. You could arrange them on a microwaveable plate and heat them up a little right before serving, because they taste best warm. Let me know how it turns out! These do look yummy. This might be something I make on Thanksgiving. Definitely a great receipe to serve for overnight guests. Yes, I don’t think you could go wrong serving it to your guests! I’m getting together with family for Thanksgiving (first time in 25 years) at a cabin resort in Gatlinburg, TN…..this sounds like a great recipe to make for breakfast one morning!! It would be a good recipe because it’s so quick and easy to make! Gatlinburg is such a great place to visit! Hope you have a great Thanksgiving there with your family! THIS REALLYM LOOK GOOD. WE HAVE A 30MIN. COOKING SHOW ON PULIC ACESS TV 10 HERE IN CORPUS CHRISTI TX. ALWAYS LOOKING FOR NEW RECEPIES TO TRY ON OUR SHOW THIS LOOK DELICIOUS. Yes, I’d love to hear how this turns out for you! Crab meat would be a great substitute for the bacon. They both sound delicious! I want to use this idea with my sourdough biscuits. Thanks. I have got to try this over the break! These look amazing and so great for this time of year when we need quick things to make for out of town guests. Thanks for sharing! I’ve never heard of those, but they look very good. Anything with bacon and cheese is good, isn’t it? 🙂 I have saved this recipe in order to make it sometime because I’m sure I’ll want to someday. Thanks for sharing. This does look easy – and so tasty! It looks like a great dish for potlucks, travelling, anytime! That looks so good! How do you take such good pictures? I often cook something that looks really good, but the picture doesn’t do it justice. Thank you! I’ve found that taking photos in natural light really helps, and it doesn’t hurt to have a good camera, either! Mine is an older Canon Rebel XT, but it still does a good job! This sounds really delicious! Would be great for the holidays! I’ve done that before too–glad I’m not the only one! 🙂 Thanks for visiting! What a delicious looking dish. It has everything good about life in it – bacon and cheese. Yum! 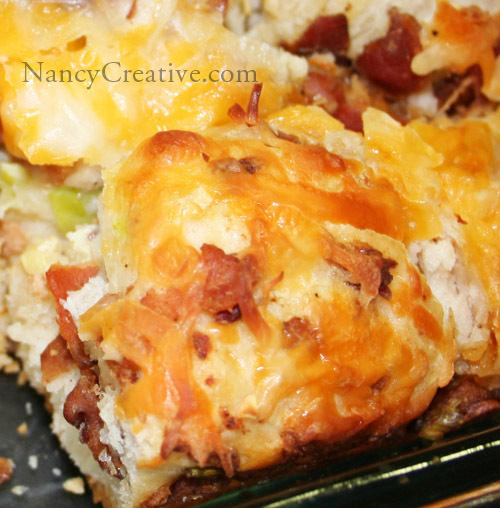 I’m always looking for a nice breakfast casserole to make and this seems like a winner! Thanks for sharing! Saw you over at Blue Cricket Design! Um, can we say YUM! This looks FANTASTIC! I can’t wait to try it! I would love for you to link this up to my What’s Cooking Wednesday! These look delish! I must try them. Thanks for sharing them over at Blue Cricket. I love adding good recipes to my collection. There should be some type of law against posting something that looks so yummy!!! Shoot… I was ready to lick my screen!! I WILL be trying this one!!!! Thanks so much for sharing!!!! I think I just died, and then woke up in bacon and cheese heaven! I am totally making this for my next get together. Who doesnt love bacon and cheese period! I hope you can come and join in my linky party today! This looks so good. I think I need to plan a brunch just so I can try this recipe. I love this recipe and have been making this for our Christmas morning brunch for several years. It is so easy and yummy, you won’t be disappointed! What kind of Pillsbury biscuits are these? I couldn’t find them in a 16.3 oz container. I made this tonight with a 12 oz package of what I hope were the right ones. I’ll find out, I guess. Hi Kari–Pillsbury® Grands® Flaky Layers Refrigerated Original Biscuits come in the 16.3-oz. can–I didn’t realize there was that much difference in the sizes of those refrigerated biscuits. I will update the recipe and mention the Grands® name. Sorry about that…I hope your Pull Aparts turned out okay…please let me know! Yes, just had them. They were fine. If anything, I don’t know how 4 more ounces of biscuits would have worked. The consistency seemed to be pretty good with just using 12 ozs. I did screw up and dump the cheese in before the cut up biscuits though, but I still think that I got them pretty well coated with the egg mixture. Just wanted to let you know your recipe was featured at today’s What’s Cooking Wednesday! Is there a substitute for the Pillsbury® Grands® Flaky Layers Refrigerated Original Biscuits? Kevin, you should be able to substitute any other refrigerated biscuits that come in a similar-size can (anywhere from 12 oz. to 16.3 oz.). Hope that helps! I think that’ll help a lot! We don’t have Pillbury biscuits here in the PH. Thanks! Do you have the nutritional info for these? Fat and calories per serving? I googled Bacon-Cheese Pull Aparts and found the info at Pillsbury.com–1 serving (1/8 of the recipe) is 300 calories (calories from fat 150). Total fat grams–16g. Hope that helps you! Delicious!! Found you at Foodie Friday. Would love for you to come share this one in our Star Recipes Collection! Thanks for letting me know about your recipe collection–I will be adding the pull-aparts to it! 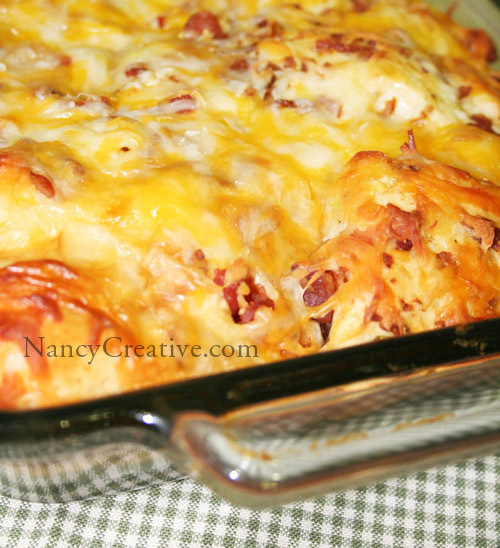 Thank you for posting this recipe on Everyday Sisters Sharing Sundays – Appetizers!! This weeks theme is CHICKEN. Please come back and post some of your favorite chicken recipes to share with our followers. We hope to see you there! Talk about decadent. Serious Food For the Soul just posted these on Facebook and I had to check it out. I was like oh a post I haven’t seen! These look delish! I can’t wait to try them this weekend!! Are they dry at all…do they need any kind of dipping sauce or butter or moist as is? Thanks for sharing!! Thanks for this recipe. We actually had it for dinner tonight, and it was fantastic. Thanks for sharing it. It’ll be a permanent fav in our recipe collection, and I shared it with a bunch of friends on FB who wanted it too. Thanks again! Love your blog! I’m so glad you like the recipe, Tracie! Hope your friends enjoy it, too–that’s great that you shared it with them on FB! Do you think this could be made ahead? I would love to have it made the night before for Christmas morning! Sounds yummy! I’ve never tried making it ahead, Cara. If you wanted to try that, you’d probably need to refrigerate it and then reheat it just before serving. It tastes so good when it’s fresh out of the oven, though! So here’s another idea–the night before, cook your bacon, measure out your cheese and put in a ziploc bag, and chop up your green onions, storing them in another ziploc bag. Refrigerate these prep ingredients and have all your other ingredients handy so you can put it quickly together in the morning. If you do make it ahead, let me know how that works out! Thanks for the link, Jennifer! 🙂 I’ll be stopping by! Wonder what garlic powder added to the mixture would do to these? I made these last night. I ommited the green onions.and chopped up a jar of jalapenos instead. Was sooo good!. Will definatley make it again to try with the green onions. Thanks! Hi Natalie, just wanted to mention that if you aren’t able to get that particular brand, you could substitute another brand of refrigerated biscuits, and that should work out fine!